The New Year is upon us – and it’s time to make some changes! Many of you are asking how to can save money and be energy-efficient, so make it your resolution! Here are some great tips on how to conserve energy, increase lamp life and save money on lighting in 2011. 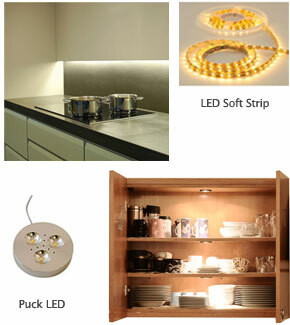 The average home will use cabinet lights around 2,000 hours per year; retail stores around 4,000 hours. When you install LED Soft Strip and Puck Lights, residential homes will enjoy 20 years of illumination! The flexible and linear LED Soft Strip uses between 1 and 3 watts per foot and has all kinds of connectors to create custom shapes and sizes. LED Puck lights are compact, 3 watt fixtures that look great inside cabinets or closets and can either be surface mounted or recessed. No one wants their valuable artwork and priceless family photographs damaged, discolored or faded from the harmful UV and IR rays that incandescent and halogen light sources put out. 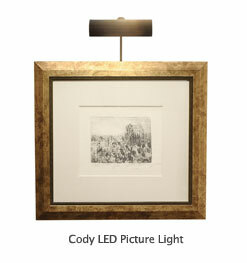 Using LEDs eliminates these concerns while also saving energy – the Cody LED Picture Light uses 6-12 watts (depending on size) emits zero harmful UV or IR rays and contains no mercury. LEDs are improving everyday, and you can always find the latest technology at Lightology. Our LED replacement bulbs are used to replace standard incandescent and halogen light sources while saving large amounts of energy and lasting up to 45,000 hours. 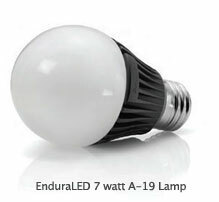 For example, the EnduraLED A-19 is a direct replacement for a standard incandescent and uses only 7 watts! This increase in lamp life helps save money, lower energy use and reduces waste. 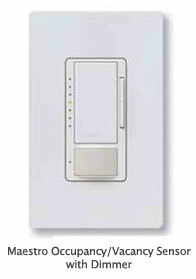 Add an Occupancy Sensor that uses motion detectors to turn lights on/off, making energy-saving a no-brainer!